These last few weeks I can't seem to keep away from River Island. They've got a gorgeous spring/summer collection and many of their clothes keep making it on to my wish list! Their spring/summer collection features summer brights and pretty pastels alongside a mixture of the season's hottest prints. They have a range of summer staple items perfect for adding to your summer wardrobe or for taking away on holiday all at great prices. You can never have too many stripes (or polka dots!) in my book! The navy striped sailor dress with a white heart belt is easy to style, it'd look perfect for day out shopping and can be glammed up with a pair of heels and some accessories for a night out. One of my current favourite items would have to be the aztec print dress. 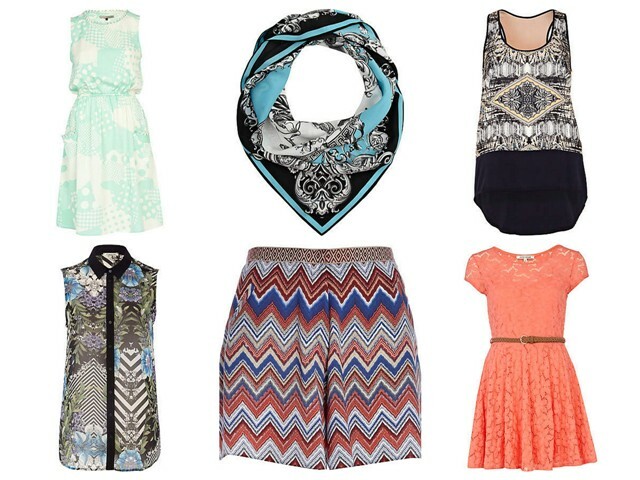 I love the print and mixture of colours, it's perfect for a summer's day and an easy way to wear the aztec prints trend. I also adore the tropical print sleeveless shirt. The print is ideal for the season and really stands out against the black trim. It'd look great worn with your favourite skinnies, styled with a summer skirt, or paired with some print trousers if you're feeling more daring! I love River Island so much. Their clothes just sing to me! I'd love the green print dress. 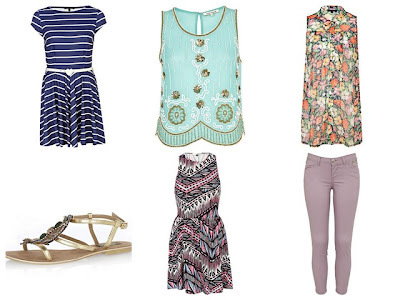 I'm loving River Island too, they have some really nice stuff at the moment. I love the coral dress and the turquoise embellished top, so pretty! Ok so that turquoise embellished top is just dazzling. I have been looking for one like that for a while to go with a pair of pants! Love all of your selections! I wish we had River Island here in Spain :( . The more I browse their website, the more I like it. Everything is so cute, and so affordable! I like it much more than Topshop. But sadly, no chance for me to buy River Island, as shipping costs make it too expensive :( . River Island always has lovely stuff :) And I'm always wishing I can get my paws on them! I love that embellished tank a lot. So pretty! Waa I miss River Island! That orange dress is so pretty. I'm totally buying a new dress from there when I am back in blighty! These are outfits that I could see myself wearing on a relaxing cruise. Yes! I love River Island. Love striped dress, so gorgeous. Loving all those pretty patterns - definitely some really cute pieces! Such pretty pieces! I've been quite restrained lately and not been buying much. But payday is coming up! I love the floral sleeveless shirt :). and I really like your blog.